Since 1977, “May the Force be With You” has been part of the global lexicon. This phrase, created by Modesto native George Lucas symbolizes the magic and influence of his epic film Star Wars, the follow-up film to his breakthrough American Graffiti. 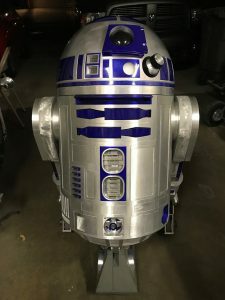 Just say “May the 4th Be With You” out loud and you will hear the pun that so many Star Wars fans worldwide have used to proclaim their love of the saga. “May the Force be with you” to all that celebrate Modesto’s best-known citizen George Lucas’s beloved Star Wars story is the phrase that binds us all together and is a message of hope for all, like peace or shalom. 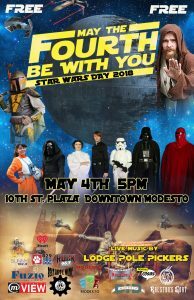 On Friday, May 4th 5 pm we will in the 10th Street Plaza once again celebrating all things Star Wars. We have invited all the Fan Clubs to join us the 501st, Mandalorian Mercs, Saber Guild, Dark Empire, Astromech Builders and Rebel Legion. 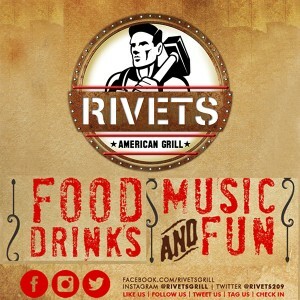 We have reached out to the NorCal Cosies and Central Valley Costumers to join us as well. We encourage you all to dress up as your favorite characters or just sport a Star Wars T-Shirt to show your love. 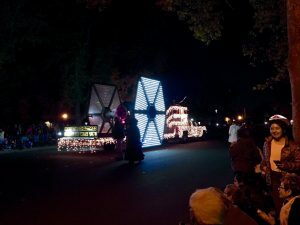 Along with all this, there will be a life-size TieFighter and a lightsaber battle when the sun goes down. Bring your friends, your family, your kids and May the Force Be With You.